Blueberries may just be the most delicious fruit on the face of this planet. Whether they are in muffins, pancakes, spinach-blueberry smoothies, salads or jam, they are sure to bring an enormous smile to the mouths that they are lifted up to – and for good reasons too. Anthocyanin-rich blueberries are chock full of antioxidants (vitamins A, C, E, zinc and selenium), and their undeniable tastiness holds their superpowers in secret. Not only do they help us to maintain healthy bones, they can even improve our eyesight, just as kale and collard greens do. Enough about beloved blueberries though, let’s move onto the other ingredients. The chia seeds are key to the success of the overall dessert, or breakfast, as you may call it. They are good to have in your Paleo pantry, as they can make cooking and baking more interesting – for instance, you can use them as an egg replacement, and as a binder in meatloaf. If you are hankering for a low-carb bread, you might find some chia seeds in there too. They also make for a nice crunch on salads. If you are inspired to use them more in Paleo desserts, we can say without a doubt that caramel apple chia parfait is one of our favorites. But oh, that chocolate! Go for quality and make a presentable dessert worthy of royalty. For the chia jam – cook the blueberries and water over medium heat until the berries burst open. Add the chia seeds and reduce the heat. Cook for 7-10 minutes until the jam is thick and the chia seeds are soft. To make the mousse, combine all the ingredients in the bowl of a food processor and blend until smooth, scraping down the sides as needed. 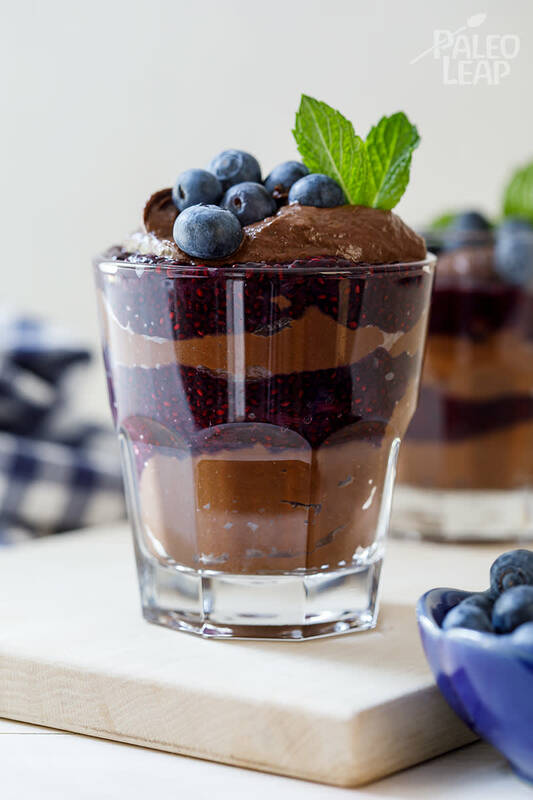 To make the parfait, layer the chia jam and chocolate mousse in serving glasses then top with fresh blueberries and place in the fridge to set for at least 30 minutes.